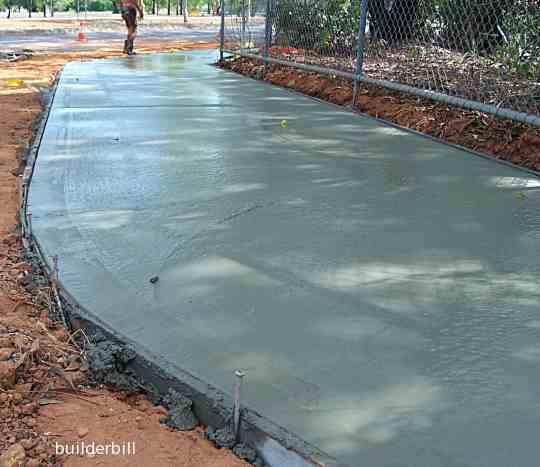 A horizontal layer of concrete laid on the ground outdoors as a pavement. Ranges from highway construction to footpaths. At the top end of the scale pavements can be enormously complicated and expensive. I had a guy working with me once that served with an aircraft runway squadron that poured huge amounts of concrete a night. They worked at night to minimise the heat build-up in the concrete (in the tropics) and for the same reason the mix water was all chilled. Below is an earlier stage in the laying of a paving slab for a house driveway. 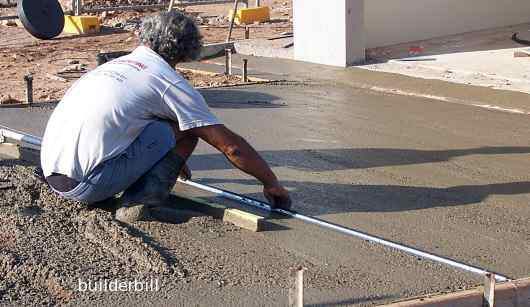 Part of the slab has been screeded level and the concreter is placing a metal control joint into the wet concrete. Both of the slabs shown are 100 thick (4") and they are reinforced with a central layer of F72 mesh or fabric.